A mother’s work is never done! 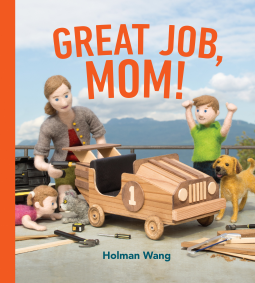 Great Job, Mom by Wang – Joyce's mystery and fiction book reviews with some non-fiction too! This is an amusing and sweet book for children and their parents. It shows a mom who goes to her day job and then comes home to more work. At home the mom is everything from a journalist to a DJ to an archaeologist as she interacts with her children and completes tasks around the house. For example, she is a DJ when she dances to music with her children. The illustrations in this book are unique. The author has crafted felted figures. He then photographs them in the settings that he has chosen. This is an enjoyable story. Thanks to NetGalley and the publisher. The opinions are my own.